How physicist and chemist look at life - what for a biologist needs physicochemistry? As part of the CREATE grant and popularizing activities, a new popular science lesson was created. The lesson entitled “How physicist and chemist look at life - what for a biologist needs physicochemistry?” was shown for the first time as part of the 21st Science Festival and now is also presented as part of IPC PAS educational activities. The goal was to combine the popularization of science with the presentation of the latest achievements in the field of optical imaging. The scenario covers both experiments and theoretical aspects of nature observation. During the classes we explain the simplest apparatus, e.g. camera obscura, as well as modern imagining techniques which are used and developed in our institute by Department of Physical Chemistry of Biological Systems group. We answer the questions about why the sky is blue and the sunsets are red, discuss phenomena such as fluorescence, light scattering, Tyndall effect. 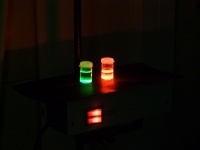 Most experiments are carried out by students or with their assistance. The lesson is dedicated mostly for secondary school students interested in natural science. The scenario was created in co-operation with prof Wojtkowski group and contains some of his research results.